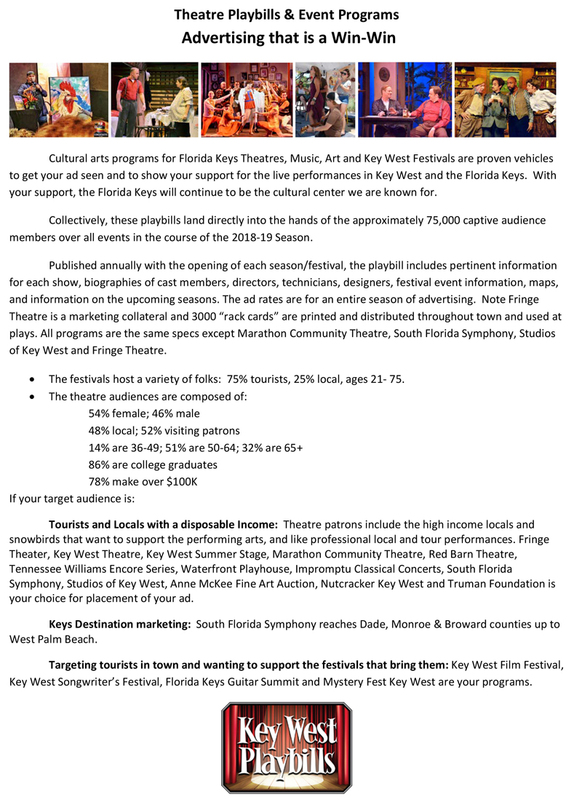 Cultural arts programs for Key West Theatres, Music, Art and Key West Festivals are proven vehicles to get your ad seen and to show your support for the live performances in Key West. With your support, Key West continues to be the cultural center we are known for. Collectively, the captive audiences these playbills land directly into approximately 85,000 hands over the course of the 2018-19 Theatre Season and over all the events. Published annually with the opening of each season/festival, the playbill includes pertinent information for each show, biographies of cast members, directors, technicians, designers, festival event information, maps, and information on the upcoming seasons.